This year I got after it kind of early with the stand placements and trail cameras. One of the first deer I got on trail cam was a real nice looking 8 pointer in velvet. Looked kind of gaunt with the emergence of his winter coat coming on. I was able to get several more pictures throughout the fall. This deer was certainly one I had hopes of getting onto but in reality was sure he would move on to other places. As it turned out the season opened on October 16th. I was only able to capture one more image of him before the end of the month. Never laid eyes on him at all. On Sunday morning November 14th I was in my stand and the rut was starting to kick off with more deer activity. Bucks were starting to cruise and I was seeing more chasing taking place. I had several encounters that morning. Nothing close enough to shoot and nothing that was close enough that was worthy of being shot. At 9:30 I heard a deer coming up from the bottoms. I could make out his body in the brush but could not yet see if he was wearing any headgear. The deer stops just before coming out of the brush and I see a tree shaking and swaying. I know it's a buck now but still have no idea if it is a shooter. When he steps out I immediately know that it's "Metric". I called him this because he was so symetrical based on the trail camera pictures. He starts to come up the ridge behind me. I move to get the bow off the hanger and position myself for the shot. Metric is coming up the hill behind me and is about 50 yards off. Plenty of time to get ready. Instead of turning out and to the right, I turn left and dam near strangle myself on my safety harness. After clearing that little fiasco up I am ready and waiting for him to come up the hill into the shooting lane. At this time he is about 25 yards away and steps behind some trees and brush before stepping into the shooting lane. When he does step in I am at full draw and ready. One mouth blat and a quick settling of the pin on his ribs and the arrow is on its way. The shot entered high on the left side and came out low on the far side. The stand is 24 feet off the ground. Perfect hit. He ran off up the hill and I heard him crash seconds later. Having not seen him crash I was going to give him an hour to be sure he was down. I made some quick calls to the wife and kids and other friends. As I was packing things up I saw some deer standing where I lost sight of Metric. I pull the bindoculars up and see a raked buck standing there in the brush. I'm thinking great, he's still up and I'm about to have a long day of tracking. As it turned out, when Metric crashed, he put 2 other bucks on their feet. It took about 5 or 6 mintues to determine that this wasn't the same buck I had just arrowed. After waiting an hour and getting onto the trail we found Metric right where I had thought he would be. 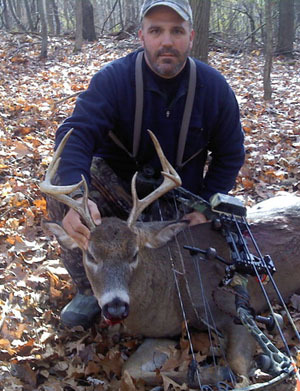 A well placed double lung shot quickly put an end to my NY archery buck season. Here are some of the trail cam pictures and the final result of my efforts to get this nice buck. He dressed out at 155 pounds. This is now my best bow kill. Hopefully we can do a little bit better in the coming years. The QDM is starting to reap some benefits here in this area. I also have some more bucks from the trail camera that would certainly be considered tropy's. I really like the direction things are going in my area.